The former chief executive of the Irish Medical Organisation departs with a €10 million pension which has been halved following negotiations. 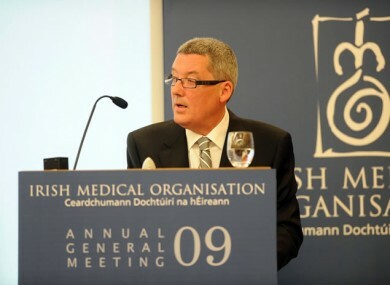 THE IRISH MEDICAL Organisation (IMO) is to undertake a review of the circumstances surrounding the contract of its former chief executive George McNeice who has left the organisation with a nearly €10 million pension settlement. It comes following an special extraordinary general meeting in Dublin yesterday where 150 members of the body which represents doctors in Ireland voted overwhelmingly in favour of carrying out the review. The meeting had been called to deal with matters arising out of McNeice’s controversial departure last December when it emerged that he had been entitled to a nearly €20 million pension which was halved to around €9.7 million following negotiations. As well as a “comprehensive, independent review” of financial issues at the organisation, an oversight committee, made up of members of the IMO, will oversee a review of the corporate governance structure at the organisation. An executive committee will also act in place of McNeice who has had no active management role within the organisation since last December and is to officially retire at the end of this month. Earlier RTÉ reported that McNeice had claimed he is entitled to a further €10,000 from the IMO for payments for VHI health insurance next year as well as a painting given to him by the organisation’s former president Cormac McNamara. The IMO is set to reject these claims. “Following this EGM we can now proceed quickly to establish an independent review to examine all the various matters related to this controversy and begin the process of rebuilding the IMO as a member focused organisation,” he added. It is not clear whether McNeice, who worked in the IMO for almost 30 years, intends to cooperate with the review. Under the terms of his €9.7 million pension settlement he will receive a termination payment of €1,495,850. In addition, he will receive annual payments of €200,000 every year from 2016 to 2021 and €250,000 per annum from 2021 to 2032. Email “IMO to review circumstances of McNeice's €10m pension”. Feedback on “IMO to review circumstances of McNeice's €10m pension”.